Nuisance wildlife control is the art of wildlife damage management. Dealing with animal pests requires a complex understanding of what is causing the human-wildlife conflict in the first place. Wildlife damage management means managing the damage problems from wildlife, not managing wildlife. Prevention, habitat management and exclusion are preferred methods of managing damage. Lethal take of wildlife must be humane and comply with local, state and federal laws. 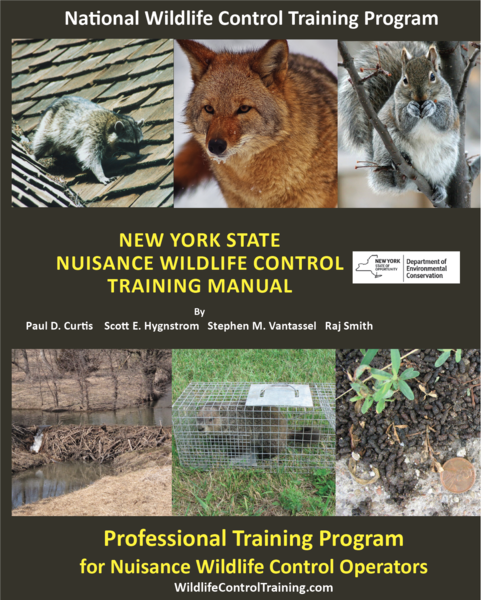 This website was created by the National Wildlife Control Training Program for New York State Nuisance Wildlife Control Operators. You many study for the NYSDEC test using the material on this website or you can Click here to purchase a printed copy of the New York State Training Manual to prepare for the New York State NWCO license. To get a New York NWCO license, you must pass the NY NWCO exam, complete the application, and pay the license fee. The New York State NWCO license authorizes you to act as an agent for a property owner or lessee. You must have a signed contract or written permission from that person stating that you have been hired to act as their agent to take nuisance wildlife on their property. 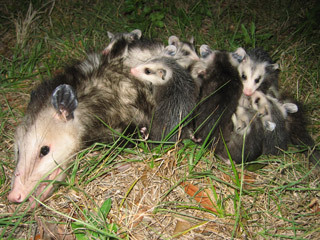 You are allowed to take, temporarily possess, and transport any wildlife, except for those species detailed below, when that animal damages public or private property, or under conditions detailed in a permit issued by the DEC.
Click here to take the online training program and New York NWCO exam. Click here if you want to purchase training opportunities.